This is the outfit I wore before it snowed -but the snow is almost gone now, only little traces of it here and there-. The mid length leather skirt that I wore in THIS post, which I shortened using a big buckle belt, to wear with this outfit. Regardless of the 'small' size of this Faux Fur coat, it's so big on me. But I can't deny the warmth and comfort it provides for me. And I must say it's a good faux fur, all soft and fluffy. I seriously love that faux fur coat... I just want to touch it, haha! And I like how you reworked the leather skirt. Hopefully our weather warms up soon! 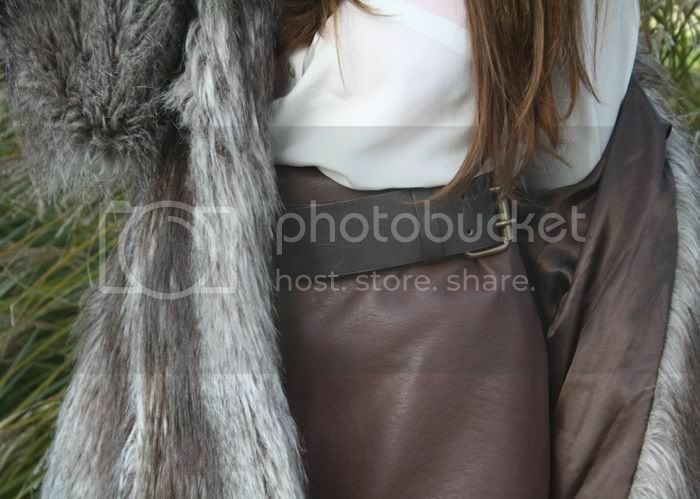 I LOVE THE COMBINATION OF LEATHER SKIRT AND FUR COAT! LOOKS AMAZING! I'm in loove w the coat <3 fab!